The former Chief of staff, Lt. General Ipoola Alani Akinrinade, Sunday, slammed those criticizing President Muhammadu Buhari over his statement that his West African School Certificate Examination certificate, WACE, was with the Nigerian Army. In a statement disclosed by Mr President’s special adviser on Media and Publicity, Femi Adesina, the former Chief of Defence Staff insisted that Buhari has a certificate. Angered at the spate at which Nigerians lambast Buhari over his certificate, Akinrinade blamed the Nigeria’s recording system. His words, “How many years ago ?… 50 years. And Nigeria with our (poor) record keeping and filing things into an archive. If we have an archive at all; an archive inhabited by rats and cockroaches. I think it’s an insult”. However, clearing the air he said that the certificate saga was an insult to the Nigerian Army, noting that the time Buhari joined the Armed forces ‘there were no cutting corners’. 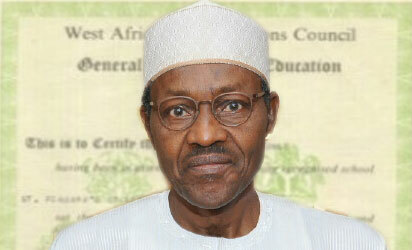 “… The most annoying one is the case about (Muhammadu) Buhari not having a Certificate. It is an insult to the Armed Forces, a terrible insult to the Armed Forces. If they are so embedded in the system and they have lost their souls, then they can go ahead and join everybody else in castigating a General of Buhari’s calibre. They are now talking about a School Certificate. By the time he joined the Army in those days, there were no cutting corners. It is later when these same Civilians took over from the Army that admission into it became less transparent. I can give you an instance. There was Course Five around 1964: if one did not have a School Certificate, one couldn’t apply to join the Army. And I know up to 1963 when the last General Officer Commanding left Nigeria, there were no corners to be cut. There was no such thing. Everything was on merit. And that was how it was till Buhari’s time. Buhari attended the Mons (Officer Cadet School in Aldershot in England) and the Staff College. I don’t want to think they have an idea what they teach in those places. And the rest of us pretend as if we don’t know what they do there. You send a man to America for one and a half years in a Military School. Do they think he just went there to learn how to fire a rifle ? As I speak to you, I don’t know where my original Certificate is because we gave the original to the Military Board. They took it from us when we applied to join the Army. You give the original copy of credentials to the Board. They take it and keep it in your file, that’s what happened. How many years ago ?… 50 years. And Nigeria with our (poor) record keeping and filing things into an archive. If we have an archive at all; an archive inhabited by rats and cockroaches. I think it’s an insult.